PT Apexindo Pratama Duta Tbk - Apexindo is a reputable oil and gas company in Indonesia. Apexindo operates primarily as an onshore and offshore drilling contractor. Apexindo running business in providing services for oil, gas and geothermal drilling industries. Apexindo was first established in 1984 and initially registered as offshore drilling contractors. The Company was listed and first traded its shares on the Indonesia Stock Exchange on 2013, with trading code APEX. As of December 2016, PT Apexindo Pratama Duta Tbk is 73.97% owned by PT Aserra Capital, and 26.029% by public. Based in Jakarta, Apexindo now has 16 rigs spread in all over Indonesia. 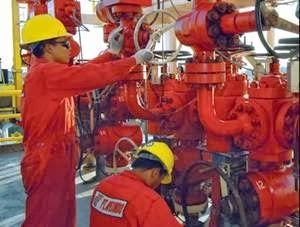 According to PT Apexindo Pratama Duta Tbk Annual Report 2012 as cited by JobsCDC.com, Apexindo total revenue in 2016 amounted to US$105.17 million decreased by 57.29% compared to the year 2015 amounted to US$246.28 million. The Company's total asset in 2016 was down 3.10% at US$682.4 million as compared with US$704.3 million in 2015. Minimum 5 years of experience as Chief Mechanic or Maintenance Supervisor (standalone) on a 1000 -2000HP drilling rig. Prior work Experience with OEM (CAT /NOV/TESCO) is a plus. Possess OEM training and certification considered is a plus. Minimum Vocational / Trade School certified (Millwright, Heavy Diesel Mechanic) from a recognized institute. Computer literate, minimum Microsoft Office, and Outlook. Minimum 5 years of experience as Chief Electrician or Maintenance Supervisor (standalone) on a 1000 -2000HP drilling rig. Prior work Experience with OEM (CAT /NOV/ ABB/ Siemens) is a plus. OEM training and certification considered is a plus. Possess Electrician’s License (MV) is a plus. Minimum 5 years of experience in the similar position on cyber jack up rig. Possess valid certification in IWCF/ IADC. Have technical knowledge in drilling equipment and drilling process for offshore/onshore operation. Have a thorough knowledge of rig emergency signals and procedures. Have a thorough knowledge of hand signals and safe working procedures for equipment handling. Legislative safe work practice knowledge. Minimum diploma degree in Public Health or Engineering. Minimum 3 years of experience in the similar position in drilling industry. Have technical knowledge in drilling equipment and drilling process for offshore/onshore. Experience in piling, crane operation, deck machinery, winches, 4-point mooring systems, spud systems, dredging, rock-laying for breakwaters. Have technical knowledge in drilling equipment. Have legislative safe work practice knowledge. Have occupational offshore HSE knowledge and experience. Have technical knowledge in drilling machinery & Drilling process for Onshore/offshore. Perform assigned duties in a safe efficient manner in accordance with Company Policy and good rig husbandry. Able to work under pressure and by shift. Have 5 years of experience as Assistant Rig Superintendent or Toolpusher. Possess valid certification in IADC/ IWCF. Have technical knowledge in drilling equipment and drilling process for offshore operation. Minimum 10 years of experience as secretary. Minimum 2 years of experience in training area. Excellent skills in word, spreadsheet, and presentation applications. Familiar with oil and gas industry. JobsCDC.com now available on android device. Download now on Google Play here. Please be aware of recruitment fraud. The entire stage of this selection process is free of charge. PT Apexindo Pratama Duta Tbk - Officer, Chief, Supervisor, Superintendent Apexindo October 2017 will never ask for fees or upfront payments for any purposes during the recruitment process such as transportation and accommodation.